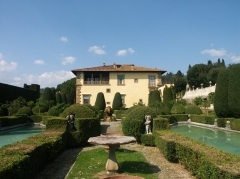 Florence's museums, palaces, and churches house some of the greatest artistic treasures in the world. The most popular and important sites in Florence include the Cathedral, the Baptistery, the Uffizi, the Bargello, and the Accademia. The churches of Santa Maria Novella and Santa Croce are veritable art galleries, and the library of San Lorenzo is a magnificent exhibition of Michelangelo's architectural genius. Wander some of the oldest streets in the city until you reach the Arno River, cross the Ponte Vecchio, and experience the "newest" area of Florence, the Oltrarno.